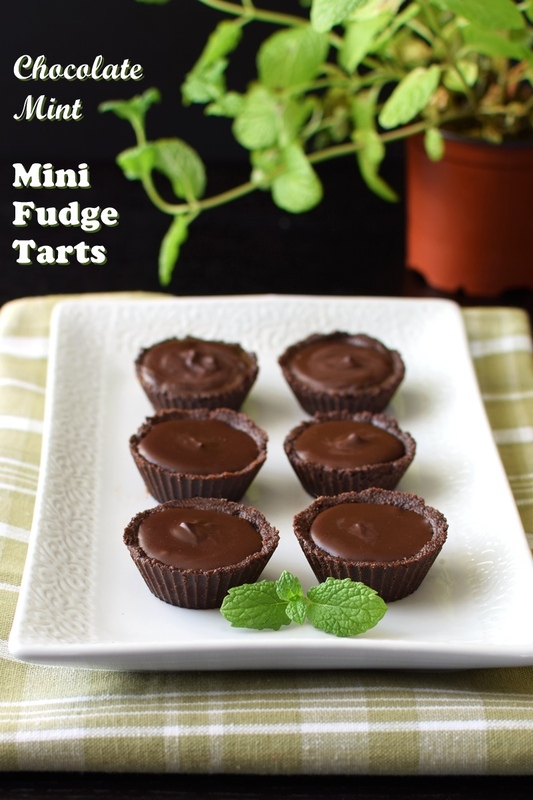 I first made these little fudge tartlets several summers ago, when I had a serious chocolate craving. The recipe popped up again when I was looking for a quick treat to whip up for Tony on Valentine’s Day. Since he already devoured every last Chocolate Chunky Monkey Cookie, we were left without a sweet to enjoy on the actual holiday! 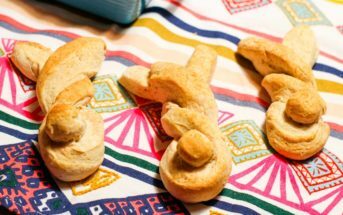 Fortunately, these were super-easy to make, and it gave me the chance to take new photos of the recipe. 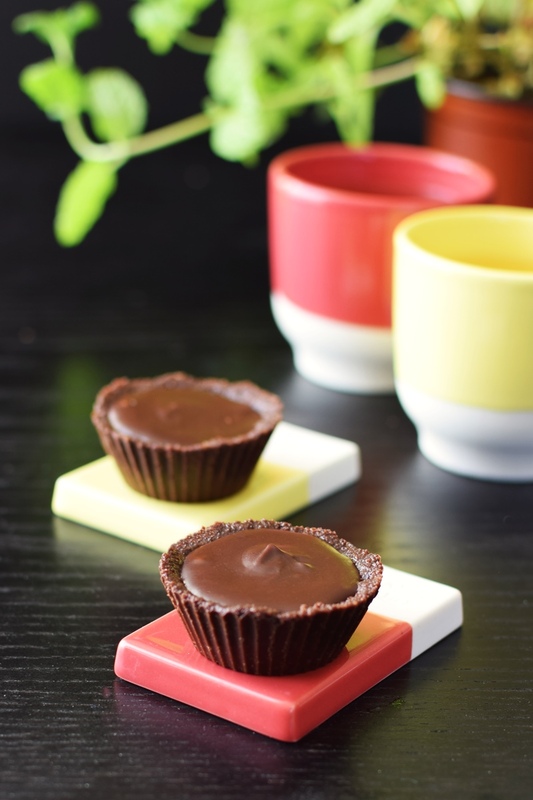 These little fudge tartlets are really a year-round treat. Of course, they’re a great chocolate gift for Valentine’s Day, Mother’s Day or Father’s Day. 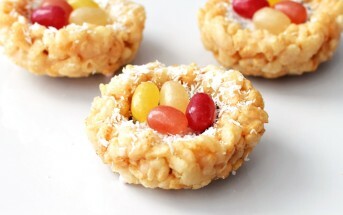 But they’re also a delicious no-bake sweet for summer. You can stay with the cool minty theme, or swap in vanilla or orange extract. However, in winter I’d stick with the seasonal peppermint flavor, as these are perfectly-sized for holiday parties. 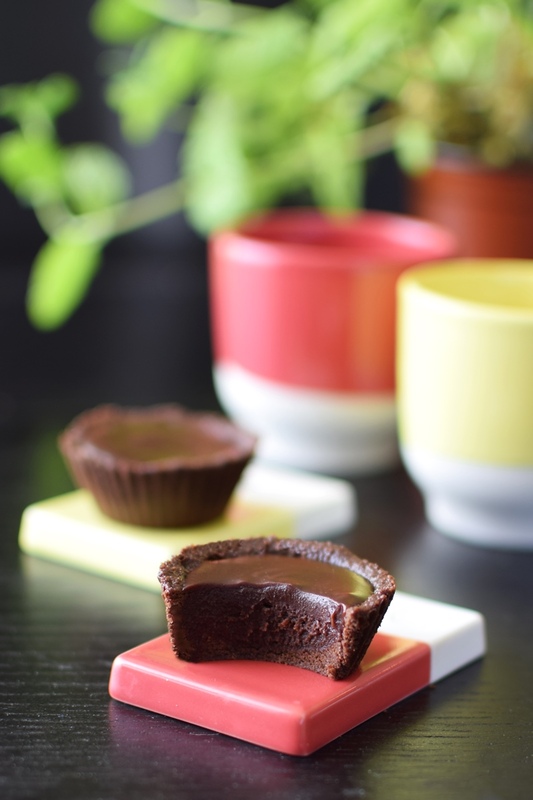 When made with the ingredients that I’ve linked to, these two-bite fudge tartlets are also top food allergy-friendly. 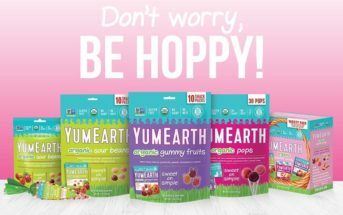 So you can most likely share them with gluten-free, vegan, and food allergic chocoholics, too! Pressing crusts into mini cupcake liners can be tricky. For the easiest execution, I use individual silicone mini muffin molds. 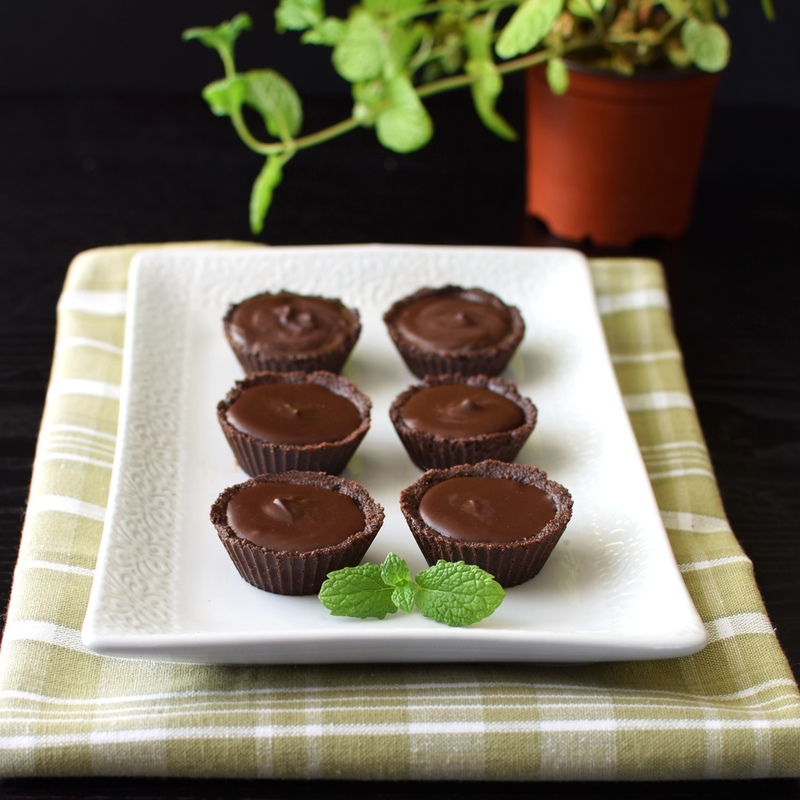 They’re great for making mini cupcakes and dairy-free peanut butter cups, too! For the tartlets, just drop a spoonful of the crumb mixture into each mold and press it into the bottoms and lightly up the sides. Then pick up the mold and use your thumb, rotating the mold as you go, to easily press the crumb mixture up the sides. You’ll quickly get the hang of it! The Decadent Vegan already whipped these up, with slight modifications, and shared her version online! These little two-bite tarts are a delicious hand-held delivery system for fudgy goodness. Please note that the Prep time does not include the brief chilling time. Melt the 2 tablespoons of chocolate chips in a medium bowl. I microwave on HIGH for 1 minute and whisk thoroughly. If needed, heat in additional 15 second intervals, whisking in between, just until melted. Do not overheat. Stir the cookie crumbs into the melted chocolate until thoroughly combined. Divide the cookie crumb mixture between 12 silicone mini muffin cups or lined mini muffin cups. Press the mixture into the bottoms and up the sides as evenly as possible. See my tips in the post above. Melt the remaining ½ cup of chocolate in a small bowl. Do not overheat it. Whisk in the coconut milk and extract, to taste. I use Simply Organic for the extract, which is intense, so I use the lesser amount. Pour the chocolate-mint filling into the cookie crusts and even out. Freeze for 15 to 20 minutes. Pop out and enjoy! Store leftovers in a covered container in the refrigerator for up to 1 week or freeze to nosh on even later. *I recommend using a spice grinder (I use this) or small food processor to make very fine crumbs. But if needed, you can pound the cookies in a plastic bag with a mallet. 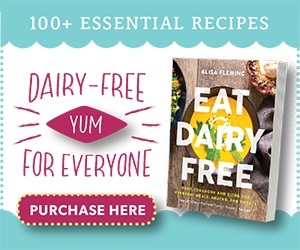 **Use good quality coconut milk that thickens when chilled (see my quick guide and video here). If it doesn't, your filling will be a bit too soft. If you only have lite coconut milk on hand, reduce the amount to 2 tablespoons. 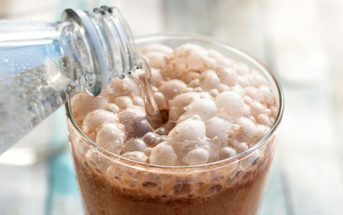 For coconut-free, swap in ¼ cup pureed avocado or 2 tablespoons dairy-free milk beverage of your choice. What can be substituted for the crunchy Chocolate Cookies? Thank you. If you aren’t looking for a chocolate crust, you can sub any dairy-free crunchy cookies or grahams. Yum Yum Yum! I already have cookie crumbles in the freezer so this recipe would another great thing to do with them! The ingredients list says “½ cup dairy-free chocolate chips,” but then the instructions say “the remaining ¼ cup of chocolate.” So, how much chocolate chips are needed? That’s awesome and your version looks great Linda! Thank you for sharing. Ohhh give me all the fun chocolate tarts and no one gets hurt! :-))) These look so delish! These are adorable! They look super fudgy too! Love these! With Thin Mint cookies this time of year and the cold temps we’re still in a mint mood, especially when chocolate is evolved and these look absolutely amazing! Yes, and mint is a St. Patrick’s Day flavor, right? 🙂 I like mint for its cooling affect in summer, too! I couldn’t love these more! My family would and will devour these, on my list to make. Thank you for sharing! Oh I know what you mean! We also devour those things way too fast considering how dense they are! They look so FUDGEY!!! I can’t wait to make these. These look so good! Like a mint meltaway in a cookie shell. 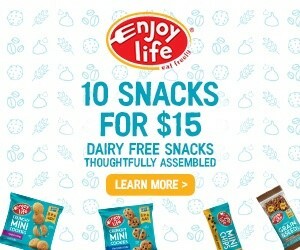 I might have to go get some Enjoy Life chocolate cookies today….